The iPad is a pretty nifty thing. If you believe the true enthusiasts, there’s nothing you really can’t do with an iPad. We all know that if iOS apps were an ocean, we would all be long drowned. This is not even considering the fact that some iOS devices are jailbroken. So we all know there are lots of very cool apps The 10 Top Free Apps For The iPad The 10 Top Free Apps For The iPad Read More out there, and if you’re willing to pay a few dollars for some once in a while, you and your iPad can have the world at your fingertips! (well, almost). But even without downloading anything at all, there are some pretty handy things hidden in the iPad. Yes, you’re not imagining things, this is a 2-for-1 tip! Those of you who’ve had the iPad for a while might remember that the little button on the right side, just above the volume control, used to lock the screen rotation. In iOS 4.x, this is no longer the case, and this button is now a mute button. So how can you lock the screen rotation? There are two ways. If you really liked having the hardware button locking your screen, you can turn back time and give it back that function. In Settings, go to General and look for “Use Side Switch to:”. Simply change this to “Lock Rotation“, and you’re done! The mute button will now lock screen rotation. But wait a minute, what about muting? That’s also quite a useful function. You can choose to leave the button as a mute button, and lock screen rotation using a different method. Double click the Home button to access your open applications, and slide your finger from left to right, so as to reveal what’s on the left side of those icons. There you will find some music controls, and, surprise! On the left side there’s a lock rotation button. Note that if you prefer to have a hardware button for locking the rotation, doing this will reveal a mute button, so you can still mute your iPad whenever you wish. Street View on the iPad is so cool, I don’t know how I lived without it before I knew how to find it. In the Maps application, drop a pin wherever you’d like to have street view. You can do this by either tapping and holding a certain spot on the map (purple pin) or by searching for an address (red pin). Tap the pin and you will see a red and white man icon. Tap this icon, and you will be transported to the (awesome) street view. You can still see the map in a small circle on the bottom right, and you can tap it to go back to map view. This is supposed to be something very simple, but it took me a while to discover I can do this, as it’s a bit hidden. If you want to find a word or a phrase within a page you’ve already loaded in Safari, use the Google search box on the top right. Type in what you’re searching for, and then, under all the suggestions you get for Google searches, you’ll see “On This Page” and also the number of matches. Under that you’ll see “Find“. Tap that. This will take you back to the page, and will highlight the word you were searching for. Use the “Next” button at the bottom of the page to go to the next match. You can see how many matches there are still to go, but unfortunately, I couldn’t find a way to go the the previous match, which is kind of disappointing. iBooks is a free application which lets you read eBooks on your iPad. But you can also use it to view PDFs on your iPad, which will allow you to search, bookmark and generally do with PDFs all the things you can do with eBooks. Getting your PDFs into iBooks is easy. You can e-mail the PDFs to yourself, and then open this e-mail from your iPad. Tap the attachment, and then tap the arrow (open with) button on the top right. Choose Open in “iBooks” and you will be taken immediately into iBooks, and the PDF will open within its interface. Once in iBooks, you can choose to browse your eBook collection or your PDFs. Another way to get PDFs into iBooks is to simply add them to the “Books” section in your iTunes library and sync your iPad. The PDFs will appear in iBooks. The more of these little tricks I know, the more I love my iPad. I’m not sure why some simple things have to be hidden, but it does make the discovery process that much more fulfilling. We’d love to hear about more of these in the comments, if you have some! OK, so this is my first iPad, and have never had an iPhone. These tips and the next four were great, but what I really need to find out is how to access the root directory on the iPad. I don't own a Mac, so that is out. Jailbreak? Huh? Give me a Windows based computer and I will figure it out no problem, but this is all new. Exactly what I was going to recommend (MakeUseOf Answers). I'm sure you will get many useful answers there about jailbreaking as well. stupid idiot... u really think people using the ipad are so stupid. my 3year old son knows all these tricks.. get over it..
so, anyone who found those tricks helpful is an idiot now? If you have nothing constructive to add don't bother commenting at all. These are really excellent tricks for iPad. Thanks! I fail to see why some people would reply to something that they already know. I have purchased an IPad & sent it to my wife for her use, Not everyone is as intellectual & well versed with this technology & these tips are useful to them, keep them coming for us lowly types just getting into the IPad . 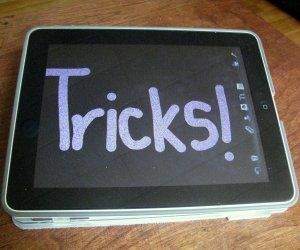 "4 Useful iPad Tricks You MAY Still Not Know About"
I'm very glad you found them useful! I didn't know about street view on iPad... It's great with the touch interface! Great tips. The simple things are always good to know. Also try calibre for book conversion and newspaper grabbing too. calibre is an ebook library manager. It can view, convert and catalog ebooks in most of the major ebook formats. It can also talk to many ebook reader devices including the iPad. It can go out to the Internet and fetch metadata for your books. It can download newspapers and convert them into ebooks for convenient reading. It is cross platform, running on Linux, Windows and OS X.
I like calibre cause I can load books on both my iPad and reader and read in low and high light. Thanks for sharing.....for those of us new to the world of iPads. Rally an iPad can have the world at our fingertips! ... But even without downloading anything at all, there are some pretty handy things hidden in the iPad this is awesome..this post is very well written and is quite informative! i think only the kids wont know about it..lolzz.. I'm a kid and I knew some of this.